For some reason, now I use DogeCoin too. Some mining service also offer free DogeCoin as a welcome bonus. That bonus can be used to buy GHS. So I use some DogeCoin Faucet and transfer DogeCoin balance from my wallet to Miners and use it to buy GHS. Some miners that accept DogeCoin to buy GHS can be use in Free Miners section. Here some DogeCoin faucet I use. Auto Payment every week (min 6 DogeCoin) or Instant Payment (min 5 DogeCoin). 2. Your computer could be broken in the short time, because your CPU / GPU will run at their maximum usage it will produce heat that may damage your PC. 3. Low revenue from mining, because level of difficulty to earn bitcoin is increasing this method may only give you very small BTC and may be nothing. The only advantages of this, is, you may be already own the hardware and don't need to invest anymore. I assume that you already have GPU or (Graphic Processing Unit / VGA Card). Like I said before, its hard to mine BTC nowadays using only CPU / GPU, so I suggest you to join pool. In the pool some maybe hundreds miners is working together to mine BTC and the earning will be split between them. Usually Windows user like Vista, Win 7 and above will have no problem to use this method but XP user may find some difficulty as GPU driver may be not instaled succesfully or Plug & Play. Make sure you already have .netframework4 installed in your system. For Windows XP user, install all from .net2, .net3, .net4 you can download them from microsoft site. Oke, in this method I will tell you how to mine using your GPU and CPU at the same time. You can use other pool, other software you can find in bitcointalk.org. 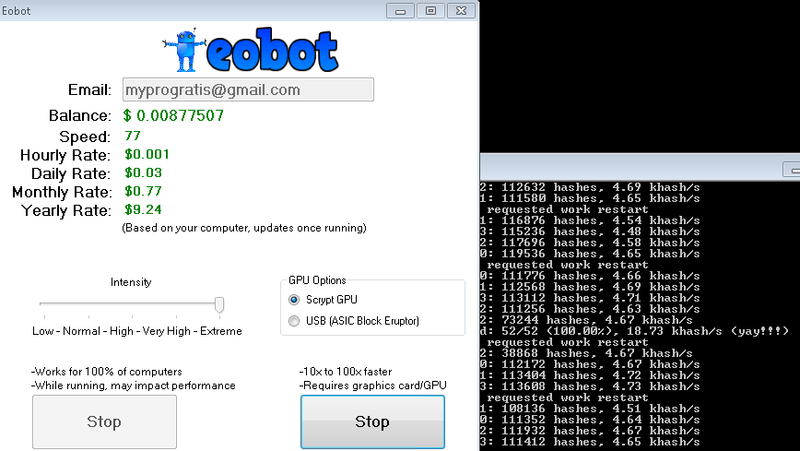 You maybe will realize that this site is not the best place to mine, but for education process please join eobot. 1. After join, go login to the site and download their software. 4. Insert your email address to sign in. There will maybe about 5 minutes the system trying to synchronize. If you want to see is your system connect or not, how much actual speed, your balance, you can see in account section in eobot site. At this step you already mining using your gpu. 1. From https://www.eobot.com/advanced, click download eobot windows, and choose "Windows CPU miner Download" that lead to https://bitcointalk.org/index.php?topic=55038.msg654850#msg654850, choose the right file that suit your operating system and download. 5. From your browser (https://www.eobot.com/advanced) find the code for your bitcoin worker, something like this : minerd.exe -a scrypt -o stratum+tcp://stratum.eobot.com:4334 --userpass eobot.65922:x and copy to the notepad. Replace this code with your code because if not, the earning will goes to me. 6. Save the file with start.bat, when saving make sure that "save as type" is "All files" and save it to the same directory where minerd.exe exist. 7. click start.bat to run the cpu miner. From this stage you already have two ways to mine with your hardware in Eobot. You can also use eobot faucet to earn more BTC and after you have enough BTC you can rent eobot hardware or scrypt to earn more. If you ask me, I am not an expert in bitcoin mining. I don't have money to buy ASIC miner and I don't know about expert configuration. But I will try to answer any question that I can answer. This is how it looks when they run together.